Prince Albert Friend: A Fantastic Festival! If the smiles of stall holders, shop keepers and restaurateurs are anything to go by, this was certainly a highly successful Festival. About 1 000 people a day visited Prince Albert on the main Festival days, mainly from the Garden Route and the Karoo. Most stalls reported good sales and many have already booked stands for 2008. “More importantly,” said Lisa Smith, “many visitors said they had discovered more about us and our village than in previous years”. A visitor from Gauteng said: “The tour of local houses and gardens smashed all the prejudices I’d had about the people who live here.” Others commented that they’d loved kuiering with Tannie Dadi Botma and local residents had heated debates over their choice of the most charming home. 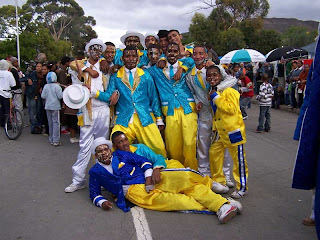 Bokkie Botha said that his committee had achieved many of the objectives they set themselves: “The visitors we had every day enjoyed the Homes and Gardens Tours, the Scavenger Hunt, the walks and talks by local guides, historians, and artists, the Street Chess and the buskers, the musicians and performers, the Street Parade and the Baba Olyfies. “They saw Prince Albert as the special place we know it is. We were determined that as many residents as possible would benefit economically from the Festival and I think that happened. I was pleased that the people of the town felt that this was their Festival. But next year’s committee will have to work harder to make sure that the poorest of the poor benefit even more”. The Festival Committee paid tribute to the Mayor’s commitment to the Festival and the personal interventions by the Deputy Mayoress, Mrs Magdalena Benjamin, the Speaker, Mr April Pienaar, and Councillor Gay van Hasselt in resolving several crises. Bokkie Botha was also full of praise for the Municipality’s contribution to the Festival and mentioned in particular the roles Johan van Zyl, Hendrik Kellerman and Karen van der Mescht played. With hindsight, there were hitches. Parking arrangements and entrance control were chaotic at times and some local restaurants appeared unprepared for the numbers of visitors. There was deservedly high praise for the police and their presence from most but some Festival-goers complained about drunkenness and drug-related activities between the school grounds and the museum. But overall, we can really give ourselves a pat on the back. The Festival brought people closer and has generated much interest in our village. We hear that Country Life and SA Olive are preparing articles on the Festival. The organising committee did a remarkable job in a short time with no resources to start with. If you think that last year’s Festival made a huge loss, it is remarkable that not only did they cover their costs but will leave a small surplus for next year’s committee. Thanks and congratulations to all of you! The outgoing Festival Committee invite all those who live in Prince Albert to have their say about the Town and Olive Festival at a public meeting on Wednesday, 6 June 2007, at 17h30 at Onse Rus, Church Street.